What do these words all share in common? That’s right! 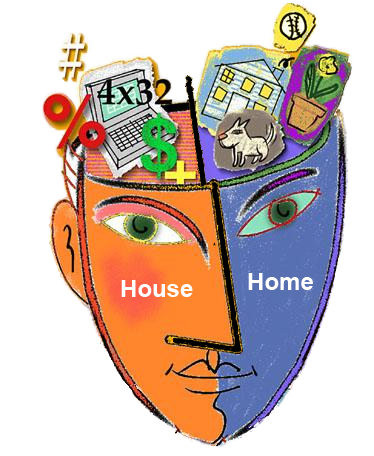 They focus on the “emotional” aspects of having a home, or the experiences you will have once you are in a house. Now, think of the word “house”. What comes to mind? The word “house” tends to reflect the “logical” side of owning real estate, or the house as a physical shelter and an investment. In comparing the two perspectives, which one do you think we, as your mortgage advisors, have the most impact on? You got it…the logical, or “house” side of things. With this new perspective in mind, it is easy to ask our clients permission to keep our focus on the logical, investment aspects of buying and owning real estate. At the same time, we understand how emotional the process of buying a new home can be, and that many people tend to make financial decisions with far too much emotion involved. Knowing the problems this can lead to, we also act as an accountability partner to our clients in keeping them focused on making smart financial decisions when investing in real estate. Now that you have the right perspective when buying a house, be on the lookout for the next BorrowSMART Strategy™. This entry was posted in Blind Spot 1: Developing a Plan, Blind Spot 2: Increasing Fiscal Literacy and tagged developing a plan, financial future, financial planning, goals and dreams, home loan, home loans, loans, mortgage lenders, planning, Portland Real Estate, Refinancing, saving money, success. Bookmark the permalink.